Recovery Road by Blake Nelson. Grades 9+ Scholastic Press, March 2011. 310 pages. Reviewed from ARC provided by publisher. Maddie meets Stewart in rehab and they fall in love. But love's never as easy as that and especially not when you're in rehab. Recovery Road is about finding the right guy at the wrong time and Maddie's struggle to find her own way home. But it's about more than just that. It's about the toll that alcohol and drug addiction can take on young lives. It's about learning how to be a friend. It's about turning things around and not being able to turn things around. I knew I was going to like it - it was already getting some positive buzz when I picked it up. But I loved it even more than I thought I was going to. Maddie's voice is searingly real; I felt like she was sitting across from me and telling me her story. It's a tragic story, but also a hopeful story, and there are humorous bits to lighten things up every now and then. The book made me laugh out loud and it also broke my heart. And I mean, it broke my heart. Not really in that sobbing-uncontrollably kind of way, but just because I know that these are problems that teens are facing every day. These are tragedies that are happening in towns across the country. Maddie's is a story of hope, but she has some bad stuff to get through first. The story's got a lot of layers, as Maddie moves on from rehab and enters high school again. She makes friends and loses them, sets goals, tries to move on... And always Stewart is there. Their relationship is so much more important than boyfriend/girlfriend. They save each other. Stewart is a thread connecting Maddie to who she used to be, reminding her of the importance of her recovery. I also have to mention the book's cover and title. I love the cover. It definitely caught my eye with the heart formed out of pills. And the title is absolutely perfect. I don't even know if this review makes any sense. Just go read Recovery Road. If you like books like Hate List by Jennifer Brown, It's Kind of a Funny Story by Ned Vizzini, Crank by Ellen Hopkins... go read this book! 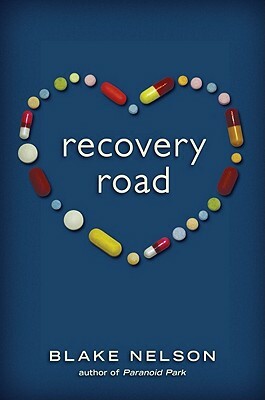 Recovery Road will be on shelves March 1!